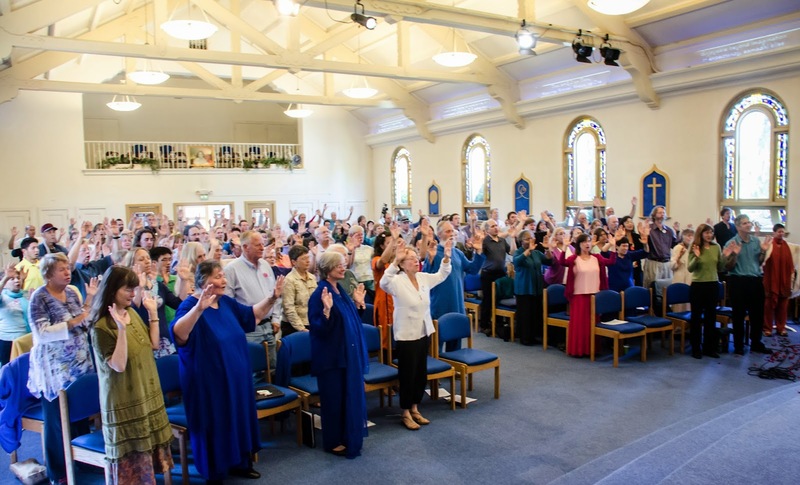 On Sunday, we celebrated a remarkably enjoyable sad occasion. (Tough to do, yes, but we’re professionals.) Dambara and Manisha are moving to Laurelwood, and so we brought everybody together for farewells with an after-service concert. We started with a sandwich bar lunch in the courtyard, along with carrot cake (for Dambara’s coincidental birthday), AUMs, blessings, and neither the first nor the last rendition of “Go With Love.” And then it was back into the temple for the concert proper. In an effort to squeeze every last bit of song out of Dambara that we possibly can, we naturally packed the program with him. His solos ranged from classic favorites (“I Wonder as I Wander,” “To Death I’m a Stranger”) to more recent favorites (“Blow, Blow, Thou Winter Wind”) to seldom- or never-heard songs of Swami’s brought out for the occasion (“Melody’s Everywhere,” “Wartime Lullaby,” and more). He managed to work in a barbershop number with the guys, too. The “Most Adorable” award, however, goes to the Dambara-Manisha duet, when they sang “Divine Friendship,” the song they skipped in their wedding ceremony 12 years ago because they weren’t sure they’d be able to make it through. Well, unfinished karmic tests have a way of cycling back around, and I’m pleased to report that our dear couple is just ever so slightly more married now. As nothing is too good for our friends, this concert was not even limited to solely musical content. Saranya recited a poem by Paul Laurence Dunbar which has to be heard to be appreciated — reading alone won’t do it. And our intrepid choir put on their dancing shoes and performed Pavani’s recent choreography to “Mañana, Friends.” Check out the video! If you’re wondering what the off-camera laughter is towards then end, some of the singers were flinging roses, like joy, at Dambara as he sang. For further vicarious experiences, we’ve got some photos and even a full-concert mp3 you can listen to. Dambara and Manisha will be greatly missed by all their Palo Alto friends and gurubhais. (The line for goodbye hugs filled the church aisle for an hour after the concert ended.) 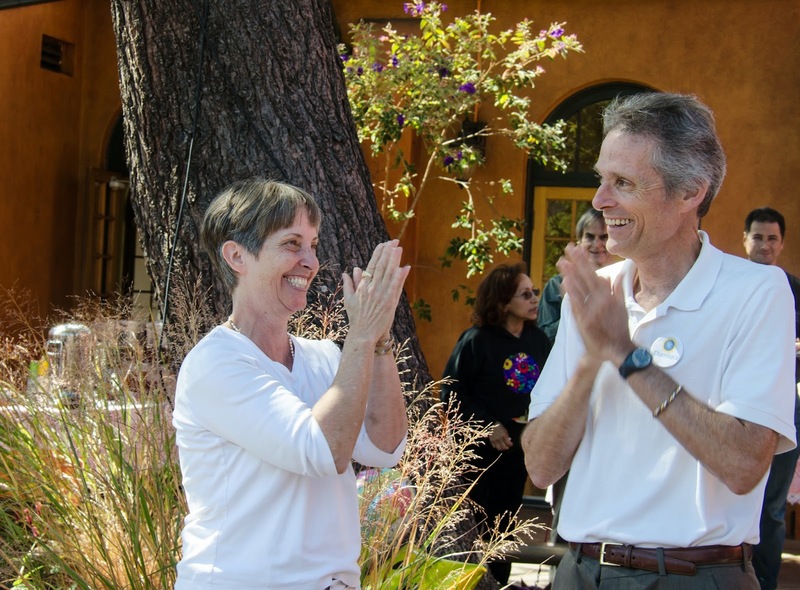 But we’re happy for them in their joyful, expansive transition, and we know the Portland-Laurelwood community has a lot to look forward to with the two of them up there. 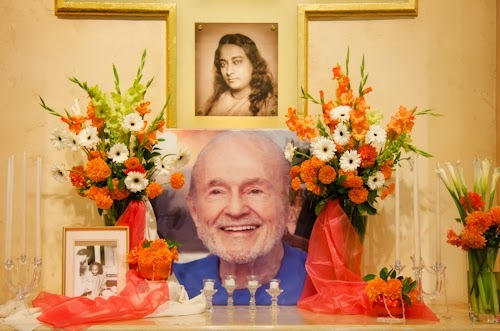 Swami Kriyananda’s 65th discipleship anniversary on Thursday evening was the first we’ve celebrated since he left his body, but as many have commented, in some ways he’s more with us now than before. 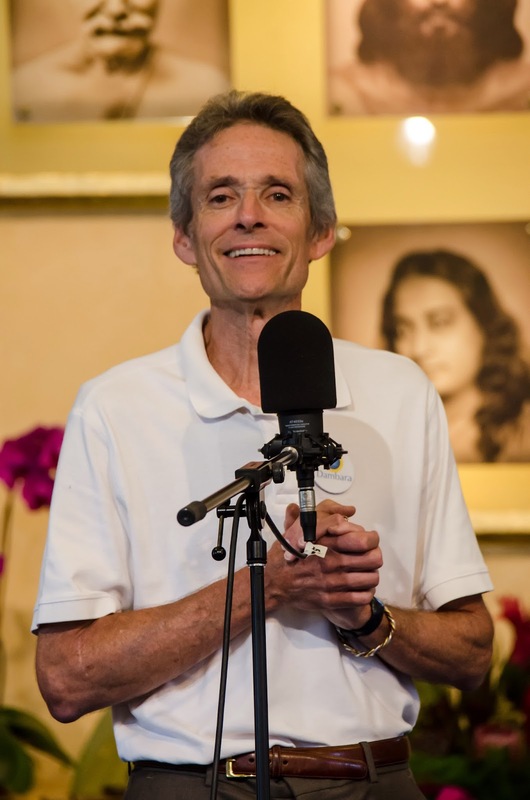 We had a very sweet and simple ceremony, with short talks from several folks who don’t usually frequent the microphone, but who shared their thoughts on Swamiji and discipleship. Some chanting, meditation, and a community offering of flowers at the altar rounded off a quietly devotional evening. On Saturday, a group of 27 enthusiastic hikers took a trip up to Tomales Point for a joyful 9-mile satsang by the sea. The day began in fog, but a meditation break took care of that, with eyes opening up to sunny skies by the end of it. There were many herds of elk around, mostly in “harem” formation for mating season, but with the notable exception of an all-male herd of brahmachari elk. Vidura led some Sharing Nature games, and Shanti provided gourmet sandwiches for lunch. (Chris hosted a delicious dinner at his home afterwards — we don’t let our yogis go hungry around here!) The highlight of the day was the final destination — the tip of Tomales Bay that offered a 360-degree view of endless blue. Also on Saturday (that was a tough decision day), we had our first workday at the new Ananda Valley Farm. Forty volunteers spent the morning doing a lot of the early stages of work required to turn the property back into a functioning farm. We cleared out a huge dumpster’s worth of old, broken farm equipment, furniture, and other abandoned items from the barn and from the bunk house. We also got rid of a broken-down shed, started clearing a trail up the hill to the spring (and what may one day be a meditation spot), and we even got a few seeds started (that’s how you can tell it’s really a farm). Fun weekend! If you’re ever bored, give us a holler. There’s a lot more where this all came from. The month of August was not nearly as dull as the lack of activity here on Ananda Family News might suggest. Luckily, if a picture is worth a thousand words, our trusty Ananda photographers can easily pick up the slack. Click each event name below for an album of photos. Enjoy! The month started off with a gourmet fundraising dinner to raise money for improvements to Master’s Kitchen. It was held at Chela Bhavan and featured Ramani’s daughter Danielle as the chef who prepared such an inspiring meal that it resulted in donations to the tune of $9,700 for the kitchen! Erica and Craig’s wedding on August 10th, was so popular that it literally outgrew the church, and we held the ceremony and the following (enormous) potluck on the community green. And fittingly enough for the wedding of two teachers, it was absolutely overrun by the most well-behaved small children imaginable. 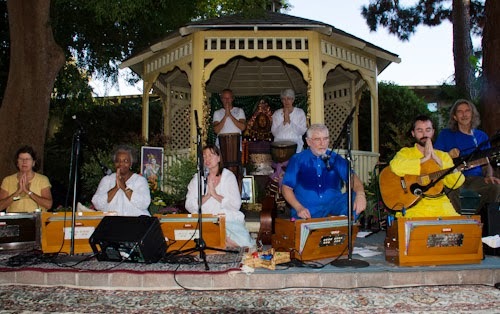 And to round out the month, we had our annual Krishna Kirtan outside in the community courtyard... a balmy summer evening filled with the names of God. Not bad for one month! What's next?